Today, office design is much more advanced than it once was. It’s therefore significantly easier to incorporate an inclusive design that welcomes and accommodates diversity and all kinds of disabilities. Employers have moral and legal responsibilities to encourage inclusivity whilst expressing it through interior design. When workplace design lacks diversity, employee retention can quickly become an issue. Therefore, it’s in the best interests of the employer, employees and the business itself to incorporate design features that are suitable for a wide range of individuals. It’s now significantly easier to incorporate an inclusive design that welcomes and accommodates diversity. When designing an office that focuses on the employees’ needs, it’s essential to start from the very beginning – at which stage, you’ll need to spend a considerable amount of time planning. Inclusive design focuses on products that provide accessibility and usability to a wide range of people, without having to be adjusted or adapted in any way. It’s therefore important to plan according to the space you have so that these items can be accessed by everybody. Putting the users of the office at the very centre of the design is essential for this, so make sure to consider them at every stage. 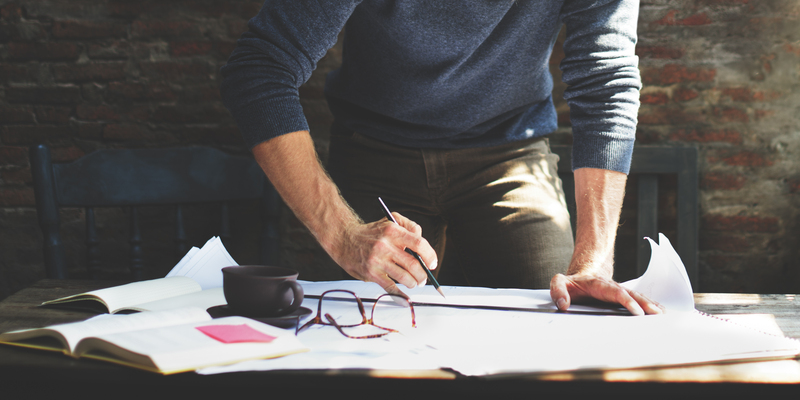 It’s a good idea to work collaboratively on a project of this kind, including your employees in the design process and important decisions – since they’ll be the ones benefitting from it, after all. When designing an office that focuses on the employees’ needs, it’s essential to start from the very beginning. Above all else, it’s important to acknowledge and accept the differences amongst individuals whilst learning which furniture items are needed to accommodate your workforce. Including ramps is one of the most simple yet effective design ideas, allowing wheelchair users to navigate around the workplace. Similarly, it’s a good idea to place door handles at a height that can be used by individuals with physical disabilities – in addition to including openings that are easier to operate; perhaps by replacing handles with levers. It’s also important that wheelchair users are given enough space to manoeuvre with ease, so consider leaving enough space between furniture for this. Ergonomic keyboards are great for accommodating anyone with muscular or motor disabilities, whilst multi-sensory alarms are better suited for those who are visually or auditory impaired. 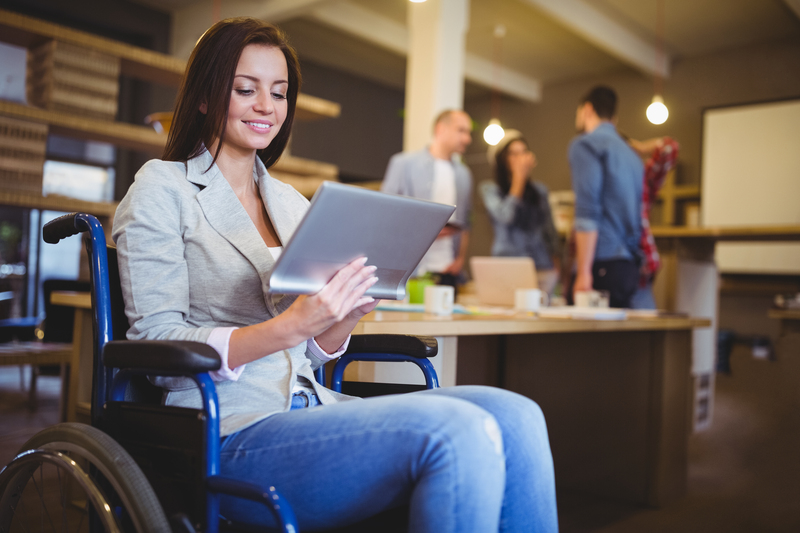 You’ll also be able to find a range of smart technologies and apps that can be used to assist people with disabilities that will make their working day easier. It’s important that wheelchair users are given enough space to manoeuvre with ease. 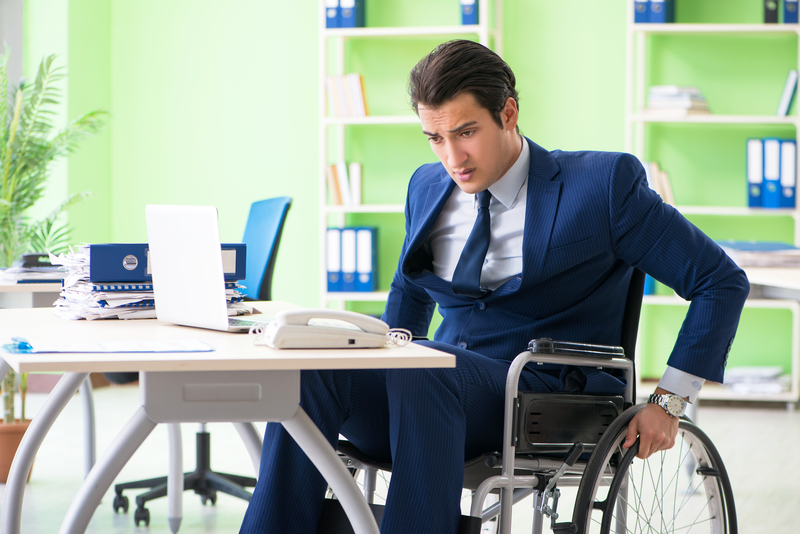 It’s essential that employers realise not all disabilities can be seen. Mental illnesses, for example, are not always obvious – so it’s important to cater for all kinds of problems that employees could potentially face. Simple design ideas can be incorporated to achieve this, such as including blinds on windows and adjustable lighting for those who suffer from eye strain, incorporating adjustable chairs and desks for those who suffer from back or neck pain, or installing sit/stand desks for people who suffer from stiffness in certain areas of the body. Sit/stand desks can be installed for people who suffer from stiffness in certain areas of the body. It’s important to remember that it’s simple to incorporate inclusive designs whilst still maintaining an aesthetically pleasing office space. Here at Cobus, we can professionally help you to achieve a functional and inclusive yet stylish office design. To find out more, please contact us here.